Blended Flavourings 10ml Flavour development, CAS details, exclusivity, confidentiality for Trade Customers. For larger quantities try our Super Six ~ £17.50 for any Six Flavours. Scroll down the page to see descriptions of over 180 flavours. Here you will find a range of blended flavours which includes our exceptional and establshed favourites along with some outstanding newcomers. 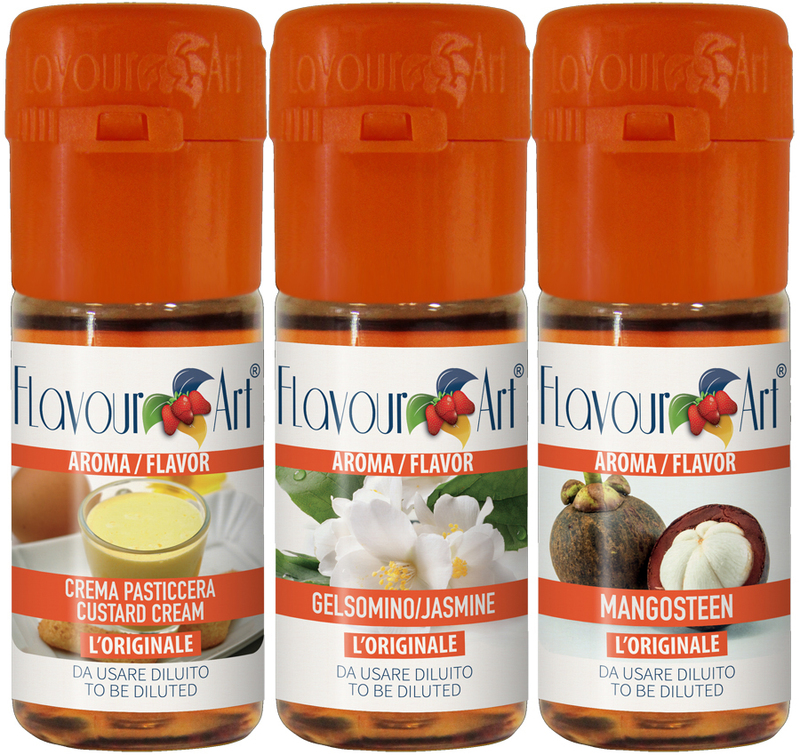 Our blended flavours are all created using FlavourArt classic concentrates with many now being produced en masse at the FlavourArt manufacturing facility near Milan. Our range of blended Flavourart flavours has increased in both number and popularity. We have grouped them all together on this page to make it easier for you to browse and order, just scroll down the page to see a full list of the flavours and click on any of them to open the description. They are all flavour concentrates ready to add to your creations and are pre-steeped to allow the flavours to blend and develop. Please do not use these flavours without first diluting them. Add the flavours to whatever creation you wish to give a unique and distinct flavour. We suggest starting at around 3%, but some people prefer more discreet flavours and some more intense, so start low and add more if required. We have tried to make the ordering process as easy as possible by having all of the blended flavour choices on one page. This is more like a spanish or italian custard - Lemon is very prominent, with a mild creamy vanillla background. I don't normally like fruity flavours as I'm a custard nut, but after a couple weeks steeping i'm really enjoying this. Just beware though, this is not your standard custard, but it would be good for those that like a custard fruit mix. Very nice flavour compliments a nice cup of coffee and with a nice hazelnut aftertaste, mixed at 5%, probably not an adv for me but maybe for others. I thought I'd try this, something a little different from my normal flavours. I like it. It's not to sweet. A good balanced flavour. Love this flavour. Usually mix it with some raspberry which I like, but it's just as good on it's own. This is my daily flavour, and pretty much what I use 80% of the time. All time favourite! Both are great flavours, but in my opinion After Dark is not good for a ADV, don't get me wrong it's a very nice vape to have after dinner or with your tea but definitely not a ADV. BYO Nutzilla in the other hand, it's the perfect ADV, mixed at 5%, it's not too sweet and still retains the awesome nuts flavour. Will try many more of this Blended Flavours for sure. I usually mix it at 8% for a nice rounded vape. If you like RY4 be sure to give this a go. Seriously impressed with this concentrate. I've just made a small 10ml mix, straight in with 10% flavour, 60/40 PG/VG, Off the bat there's lots of flavour, quit sweet but that's what I prefer. it's a complex flavour and does what it says on the tin.. Could see this being an all day vape for a while, but there's so many more flavours to try.. I really love this one! The closest to smoking a real ciggie that I have ever tried in three years, and I've tried an awful lot of tobacco juices. What makes it so much like a fag? Definitely not the taste or aroma, it doesn't smell anything like tobacco and doesn't taste much like tobacco either. What it does do, however, is leave that unmistakeable "just had a fag" taste and feeling in the mouth and throat, you know the one, not a tobacco taste, but the taste that you only get after having a fag that only smokers know and non smokers may refer to as "ash tray breath". Nothing that you ever smoked tasted like the smell of baccy in a pouch of baccy did it? That aftertaste, together with vapour to equal the throat hit and exhale you got from your old stinkies makes it for me the only juice that justifies the name e-cig, because it's a fag, and it's electronic! Flavour chasers may find this juice a bit banal, but I recommend it to anybody that wants to feel like they've just had a cigarette. What can i say, it really is Espresso and Hazelnut. Lovely bitter coffee taste on the inhale and a gorgeous hazelnut tones on the exhale. Mixed my first batch at 10% and it was a little bitter for me, so i mixed the next batch at 5%, spot on. Would make a lovely vape with a little added sweetener and/or some sort of creamy flavoured concentrate. I added a couple of drops of amaretto to sweeten mine. Lovely. Would highly recommend.